Beautifully engraved certificate from the Pittsburgh & West Virginia Railroad. This historic document was printed by the Security Columbian Banknote Company and has an ornate border around it with. This item has the printed signatures of the Company’s President and Secretary. 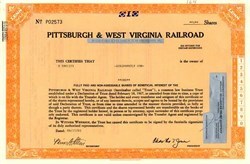 Pittsburgh & West Virginia Railroad is a real estate investment trust (REIT) that was organized in 1967 as a business trust for the purpose of acquiring the business of Pittsburgh & West Virginia Railway Co., a small independent railroad line that had leased all its real properties to Norfolk & Western Railway Co. The properties leased to Norfolk & Western include 112 miles of main line road extending from Pittsburgh Junction, OH, through parts of West Virginia to Connellsville, PA; about 20 miles of branch lines; and all other property and assets used in the operation of the railroad, such as real estate, machinery and equipment, supplies and intangibles, but excluding rolling stock, which had all been previously sold to Norfolk & Western. The lease of railroad properties extends for 99 years (from October 1964), and is renewable at Norfolk & Western's option for additional 99-year terms in perpetuity. The trust receives a fixed annual cash rental under the lease of $915,000, plus certain noncash credits, including deductions allowable for tax purposes for depreciation, retirement and amortization of debt discount and expense and all other expenses of the trust, except those incurred for the benefit of the shareholders. The lease may be terminated either by expiration of the initial or any renewal term or by default of Norfolk & Western. In the event of termination, Norfolk & Western is obligated to return to the trust all properties covered by the lease, together with sufficient cash and other assets to permit operation of the railroad for a period of one year. Under the lease, Norfolk & Western must maintain, manage and operate the property and make improvements it deems necessary at its own expense without lowering the fixed rental payment. The improvements become PW's property, for which it incurs a debt. This debt is reduced when depreciation is recorded over the life of the improvements. Norfolk & Western may sell the property it improves and record the proceeds retained as debt payable to the trust.